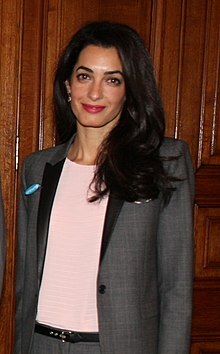 Amal Clooney is fluent in English, French, and conversational Arabic. Her father is a Lebanese Druze and her mother is a Lebanese Sunni Muslim. Some reports have described Clooney as a Druze. However, it is unlikely that she considers herself a part of the religion in any capacity, due to the Druze restriction on exogamy, her mother's Muslim faith, and her marriage to non-Druze George Clooney. She has not publicly discussed her religion, but her husband said in an interview with The Hollywood Reporter that Amal Clooney is "nondenominational....not religious at all". Alamuddin, Amal (2010). "II. Before the Trial Begins; 6. Collection of Evidence". In Khan, Karim A.A.; Buisman, Caroline; Gosnell, Christopher (eds.). Principles of Evidence in International Criminal Justice. Oxford: Oxford University Press. pp. 231–305. ISBN 978-0-19-958892-3. OCLC 663822377. Alamuddin, Amal (2014). "The role of the Security Council in starting and stopping cases at the International Criminal Court: problems of principle and practice". In Zidar, Andraž; Bekou, Olympia (eds.). Contemporary Challenges for the International Criminal Court. London: British Institute of International and Comparative Law. pp. 103–130. ISBN 978-1-90522-151-6. OCLC 871319445. Alamuddin, Amal; Bonini, Anna (2014). "Chapter 4: The UN investigation of the Hariri assassination; The relationship between the UN investigation commission and the Special Tribunal for Lebanon: Problems of Principle and Practice". In Alamuddin, Amal; Jurdi, Nidal Nabil; Tolbert, David (eds.). The Special Tribunal for Lebanon: Law and Practice. Oxford: Oxford University Press. pp. 50–72. ISBN 978-0-19-968745-9. OCLC 861207456. ^ Rosenthal, Franz (2014). Gutas, Dimitri (ed.). Man Versus Society in Medieval Islam. Leiden; Boston: Brill. p. 613. ISBN 978-9-004-27089-3. OCLC 892338528. ^ "Mohamed Fahmy, Canadian journalist, pardoned by Egyptian president, released from prison". Retrieved 6 October 2015. ^ Mackelden, Amy (6 April 2019). "Amal Clooney Is Working with the U.K. Foreign Office on a New Initiative". Harper's BAZAAR. Retrieved 6 April 2019. ^ "Amal Clooney takes Foreign Office role". 5 April 2019. Retrieved 6 April 2019. ^ Sewell, Abby. "Finding a life partner is hard enough. For those of the Druze faith, their future depends on it". latimes.com. Retrieved 19 January 2019. ^ "Keeping the faith?". america.aljazeera.com. Retrieved 19 January 2019. ^ "At Home With George Clooney in Italy: Amal, the Twins, Politics and an Incendiary New Movie". The Hollywood Reporter. Retrieved 19 January 2019.